2/1/2019 - Released top 12. Vols included. His HS has become a bit of a Clemson pipeline. Would be nice to steal another big time player from them ala Crouch. If Pruitt wants to make that a thing i’m for it. Sounds like we have several different things going for us here. Me likey. He's visiting Clemson for their spring game this Saturday which will be his third visit there in just over a month. Hopefully Tee and co. can work their magic because this kids a big time WR. yeah lets get the guys who have moneybags in their twitter handle! As I said yesterday in another thread, I don’t mind the strategy of getting his first official visit. Tennessee isn’t believed to be one of the 2-3 favorites for him right now, and after the Vols impressed him last month on his first trip to Knoxville, rolling out the red carpet for him and really impressing him potentially could shake up his recruitment a bit. That’s certainly the hope. And it’s not a huge risk on Tennessee’s part, in my opinion, because it’s a kid from Alabama — not South Florida — so the Vols should have an easier time getting him back on campus in the coming months on unofficial visits than they did with Khris Bogle last year, although even Bogle made multiple visits to Tennessee last year. Tennessee hosted a few spring official visitors last year. Wanya Morris and Khris Bogle were two of them, and I would say it worked out pretty well with both of them. Bogle didn’t end up signing with the Vols, but he obviously took a really hard look at them for several months after that official visit. The idea with most of them is that the timeline for every prospect’s recruitment has sort of been pushed up a bit — more players than ever are making their decisions by the summer or early fall — so getting an early official visit gives you a chance to be more of a factor in the final months of his recruitment, especially if that school is believed to be chasing multiple teams for the player. Am I missing something? Kid left here glowing about the visit. Tee and Ansley are recruiting him. He is returning 6 weeks later for an Official. Then Callahan comes along a month later and writes that? 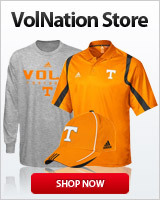 "Tennessee isn't believed to be on of the 2-3 favorites..."
Love that Tee is swimmin' in bama waters. Feel like this is big time news that isn’t getting talked about. Yeah there's 2 or 3 teams ahead of us for him but getting him here for the spring game is huge. We have a puncher's chance at any recruit if we can get them on campus. Our facilities and atmosphere and just the experience for a visiting recruit is a huge advantage.